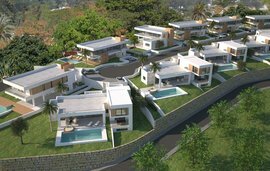 This stunning brand new modern 6 bedroom villa is located on the hillside of the prestigious Monte Mayor Golf in the municipality of Benahavis. The security in Monte Mayor is excellent as there is a CCTV system as well as 24/7 security guard on the entrance gate and roaming security patrol. This property has spectacular panoramic and unobstructed views through the beautiful valley and down to the Mediterrnean Sea and the strait of Gibraltar as well as wonderful mountain views. The contemporary design features a large open-plan living area which incorporates the lounge, dining area with a feature fireplace and large floor to ceiling glass doors which you can open up to expand the living area onto the terrace and swimming pool area. This floor also has a kitchen, guest toilet and two en suite guest rooms. The first floor comprises of the master ensuite with separate dressing room and a further ensuite bedroom. The lower level has adequate space to include a cinema room or for the more energetic a gymnasium. As you step out onto the wooden decking with built in modern bbq area you encounter the infinity pool and the enormous plot that slopes downwards and you can admire the beautiful country views. 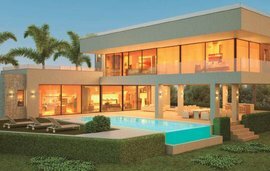 This luxurious villa has a lift and the latest Arcos Comfort System so that you can control the heating and cooling. It also has underfloor heating throughout and a carport that fits 2 cars. You are only a 5 minutes drive to the world class 18 hole Marbella Club Golf Club and only 10 minutes away from the town of San Pedro Alcantara and the famous Puerto Banus.